Your Joomla! website needs to be kept up to date and secure even when you are the one doing the content updates. The past year has seen a huge increase in breach attempts and outright hacks of websites and almost always it comes back to the site not being kept up to date and extensions not updated and maintained. 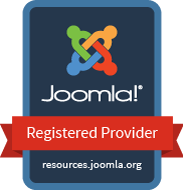 I often get calls from clients who have a Joomla website but due to one reason or another find themselves needing help maintaining or updating it. Sometimes their webmaster has gone out of business or changed their business model to another CMS, disappeared, or there was some other issue. No matter the reason it is critical to ensure your website and extensions used are up to date and have the latest security updates done. AM Graphix has been working with Joomla since 2007 (version 1.5) and can help you. Let's design a package just for you to make sure those updates are done and your site is kept backed up. I can also combine your package with time to do content updates as well. Google recognises when your site is stagnant and rates it accordingly. Contact me and let's talk about how I can help set up a regular site monitoring as well as timely updates for your site so you can get back to running your business and sleeping better at night. Which CMS is Most Secure? Read the article here.